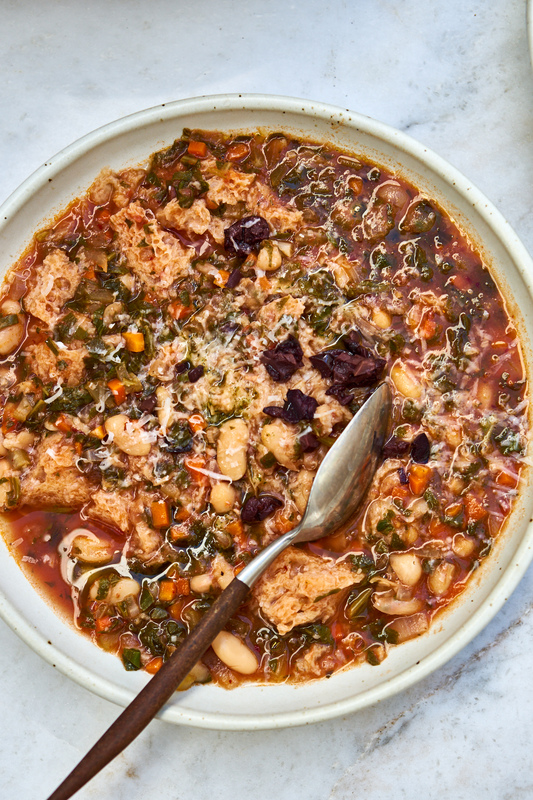 Ribollita is a thick Tuscan stew - dark greens, lots of beans, vegetables, olive oil, thickened with day-old bread. It is hearty, filling, infinitely nourishing, and flat-out, the sort of food I crave. The amount of kale you collapse into each pot is impressive, and you'll be patting yourself on the back before, during, and after you eat. Here are the details - it's a soup I make constantly this time of year. I should mention, with ribollita, it's one of those things where there are as many ways to make it as there are cooks. I normally use whole canned tomatoes this time of year - torn up. But had crushed tomatoes on hand, and they worked out nicely. You can use canned beans, beans cooked from dried, or cooked beans you've frozen and thawed. As far as guidelines go? 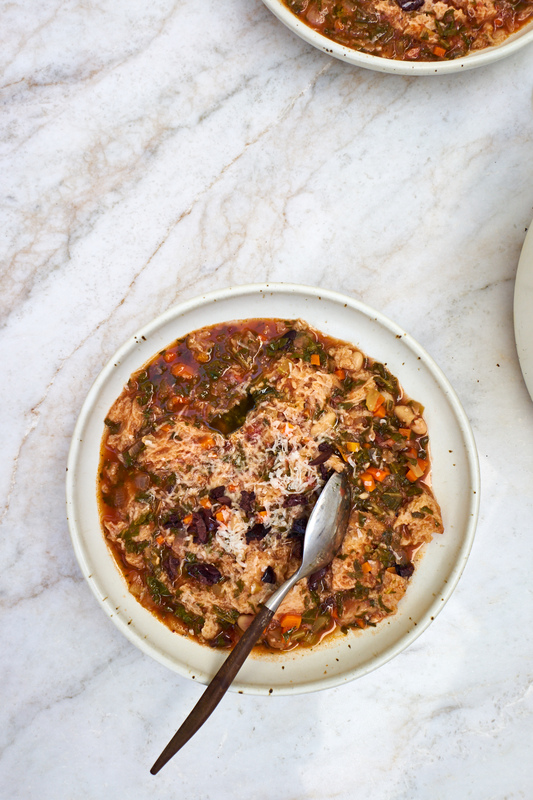 Your ribollita should be thick - eventually. A sloppy sounding, bread stew. Use day old bread, preferably a rustic loaf cut (or torn) into big chunks. The bread absorbs the broth and simmers into beautifully plump zones of pillowy dumplings. This isn't a difficult soup to cook, although it does require some chopping. If you're looking for a few ways to shave off some prep time. Use canned beans, and buy pre-washed & chopped kale. There are a bunch! In addition to the tweaks I mentioned up above, I suspect a number of you will want to know how to make it GF. Yes, you can absolutely make it without the bread. it's not the same stew, and not really ribollita, but it is still wonderful - just bump up the amount of beans you use (both the whole & mashed). I like to add a bit of lemon zest to each bowl for a bit of brightness, and because I can't help myself. And I also like the saltiness of a few olives alongside the kale, so that's a little bonus as well. I'll also drizzle a little thinned out pesto on top if I have it on hand, or, an herb oil made by pureeing olive oil, a couple garlic cloves, parsley, and marjoram together. 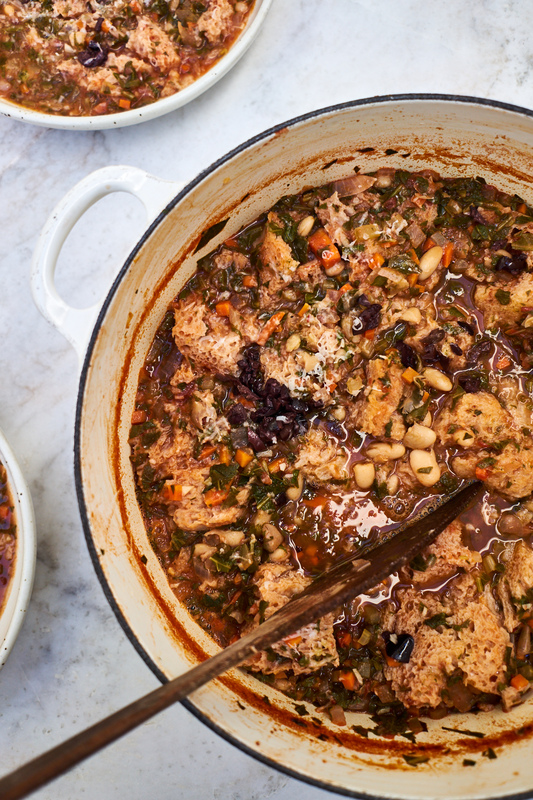 This is a freezer friendly stew. I like to make an extra-large pot of it, let it cool, and transfer it to freezer-safe containers. It's good for a month or so frozen. If I know it's a pot primarily bound for the freezer, I sometimes hold off on adding the bread. I'll add it when I reheat later. But really, you can do it either way. As far as choosing beans, I usually opt for cannellini. On the bread front, I often use a loaf of day-old whole wheat sourdough, but have at times opted for ciabatta. Canned beans can be used here, the equivalent is roughly two or three 15-ounce cans. 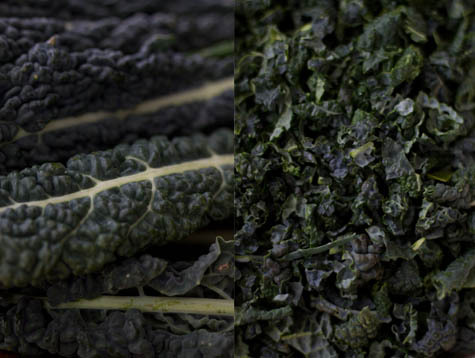 As far as the kale goes, look for cavolo nero - a craggy evergreen-hued kale that might also be labeled lacinato or Tuscan kale. The ribollita is pictured here drizzled with a simple herb oil made by pureeing olive oil, a couple garlic cloves, parsley, and marjoram together. In the meantime, mash or puree the remaining beans with a generous splash of water - until smooth. Tear the bread into bite-sized chunks. Stir both the beans and bread into the soup. Simmer, stirring occasionally, until the bread breaks down and the soup thickens, 20 minutes or so. Stir in the salt, taste and add more if needed. Stir in the lemon zest. Serve immediately, or cool and refrigerate overnight. Serve reheated, or "ribollita" meaning reboiled, the next day ladled into bowls. Finish each serving with a drizzle of olive oil and some chopped olives.